Dance Of The Hummingbirds is a painting by Judith Hall which was uploaded on January 15th, 2010. This etching has been hand signed by the artist and it is number 111 of 200 available prints. 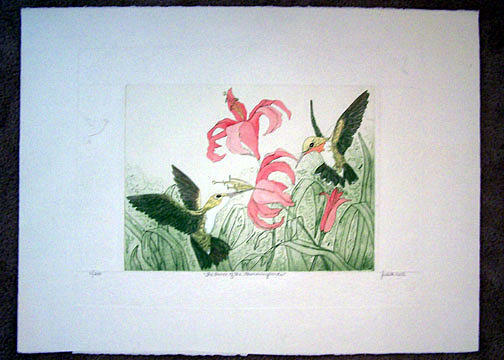 To further enhance the beauty of this magnificent etching it has been surrounded by a hummingbird and flower themed border that has been embossed directly into the rag mat paper. WOW, if you have not seen the embossed borders of a Judith Hall print, they really are beautiful! If you would like to see additional pictures of this etching then please email me and I can send you some.